Evidence for the career of the wallpaper manufacturer Réveillon comes largely from two documents both from his own pen. In both cases there is a degree of special pleading. 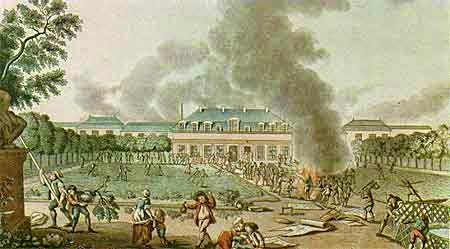 In April 1789 Réveillon's grand house and adjacent works were one of the first victims of popular Revolutionary retribution in the so-called "Réveillon riots". The aggrieved manufacturer, cowering, ironically enough, in the shelter of the Bastille, penned a Exposé justicatif, airing his credentials as benevolent employer and man of the people. He was at pains to point out that he started out as "an ordinary worker"; at one point rescued from "suffering and starvation" only by the benevolence of a friend who sold his carpenter's tool to buy bread. In this account Reveillon paints a picture of himself as an entrepreneur who succeeded by sheer dint of Weberian virtue - "economy, hard-work and attention to detail" as well as "a natural talent for speculation". 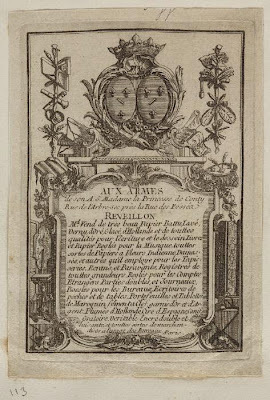 A different perspective is provided by the manuscript autobiographical dossier which accompanied Réveillon's petition in 1783 for the status of royal manufacture for his wallpaper factory and for his paper-mill at Courtalin-en-Brie. Here Réveillon concentrates petulantly on his tribulations at the hands of various trade organisations which still restricted French industry in the closing years of the Ancien Régime. This aspect of his career and his use of royal patronage to promote in early entrepreneurship is emphasised by Réveillon 's biographer Leonard N. Rosenband and, more recently, in French studies (by Christine Velut and Alain Thillay) on economic structures in the Faubourg Saint-Antoine. 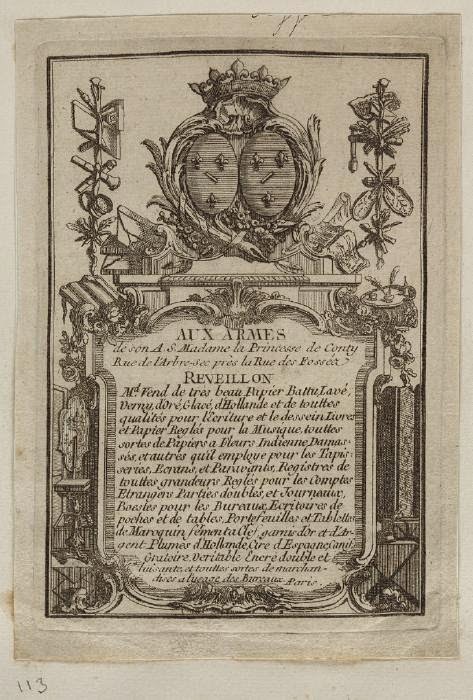 Trade card of Jean-Baptiste Réveillon, stationer and wall-paper merchant. In fact, though he may have known passing hardship, Réveillon's early career was a standard success story. Born in 1725, son of a "bourgeois de Paris"; he completed a three-year apprenticeship as a mercier (merchant-stationer) and in 1753 set up in his own right in the rue de la Harpe, having purchased his master's business from his widow and a year married his daughter, so clearing any debts. As a mercer he was prohibited from direct manufacture, but in 1756 he went into association with a paper manufacturer called François Rouilly to produce flocked wallpaper at L'Aigle in Normandy, outside the jurisdiction of the Paris corporations. This venture did not flourish and by 1761 both Réveillon and Rouilly were back in the more profitable climate of Paris. Réveillon now sought to placate the Parisian guilds by purchasing a licence as a copperplate printer and began manufacturing wallpaper in the rue de Reuilly in Saint-Antoine, centre of luxury trades and supposedly an area of "free" work. His business flourished and in 1763 he was able to rent, then in 1767 to purchase, his famous and substantial premises, the folieTiton, rue de Montreuil. His number of workers expanded from an initial dozen to 350 plus in 1789; he employed "the best designers of the Gobelins" to create a renowned product, even exporting to England. In 1772 he acquired a paper mill in Courtalin-en-Brie (Seine-et-Marne) which guaranteed supplies of high quality papier vélin (wove paper) which he claimed was the first manufactured in France. He lavished funds on the mill and adopted the son of the widow as his heir. Despite the move to Saint-Antoine, Réveillon remained hampered by the power of the communautés. As he himself emphasised, the manufacture of wallpaper was an innovative enterprise which cut across a multitude of traditional craft boundaries. The reorganisation of guilds after the fall of Turgot in 1776 created two powerful adversaries: the newly combined guild of "bookbinders, wallcovering and paper suppliers, and hangers" and the corporation of "painters, sculptors, gilders, and marble-cutters". Although he enjoyed the protection of Lenoir, the Lieutenant General of Police, his premises were raided on more than on occasion and his tools seized. In 1783, however, both his paper mill and wallpaper works received the title of royal manufacturies, and he was finally freed from guild interference. Thanks to royal protection, his business thrived. "I prospered, I was respected, I was content", wrote Réveillon plaintively from the Bastille; ".My workers were too; they liked me. I was happy". The Exposé justicatif provides a striking little sketch of his works which, operating outside the guild system, was already a small-scale factory. As always the striking feature is just how labour-intense these pre-industrial processes were. Wallpaper manufacture necessitated a high proportion of skilled men but all of his 350 employees were waged workers. At the top draftsmen and engravers might earn fifty to one hundred sous a day, then came "printers, plain-coloured sizers and coaters and carpenters" (twenty-five to fifty sous) and finally "carriers, grinders and dressers, packers and sweeps"(twenty-five to thirty sous). He also admits that "in the fourth class" he employed children aged twelve to fifteen (eight to fifteen sous), though he took care to ensure that they received religious instruction befitting their years! There is no reason, however, to doubt Réveillon's word that, by 18th-century standards, he exercised a benevolent paternalism and enjoyed the loyalty of his workforce. The folie Titon, "Titonville" as it was also called, was a highly suitable setting for a man on the make in a luxury industry. A vast estate, right in the heart of Saint-Antoine, it had originally been created in 1673 by the arms manufacturer Maximilien Titon, and was sold off on the death of his son Évrard Titon du Tillet. Réveillon installed his wallpaper factory on the ground floor of the substantial mansion and kept the first floor for his own apartment, with all Titon du Tillet's magnificent furniture and a library of 50,000 books. The house also contained well-stocked cellars, with many bottles of fine wine: 2000 were apparently rescued intact from the rioters in April 1789. The grounds were graced with pavilions and outbuildings complete with box-wood maze, an orangery, stables and a quincunx garden feature adorned with statues. Nothing now remains of the site, beyond a commemorative plaque; it was demolished in 1880 and replaced by an artisanal complex, la Cour industrie, itself the recent beneficiary of a 12-million Euros regeneration project. There is still a rue Titon and a little park which was once part of the gardens. Réveillon situated himself very much in the late patrician Enlightenment of style, education and Royal patronage. He submitted his innovations in paper manufacture to the Académie des sciences and basked in the glory of his status as royal manufacturer. In 1785 he won the prize offered by Necker for "the encouragement of the useful arts" (Sadly, his splendid gold medal was lost in the destruction of his premises; Necker promised him a new one in June 1789, but it was not until May 1792 that the National Assembly finally decreed a replacement.) He was also a close associate of the ballooning pioneer Étienne Montgolfier, whose family paper business vied with his for the honour of having first introduced brass moulds to make superior vélin. Montgolfier's circles included such luminaries as Franklin, Lavoisier and Malesherbes, and a letter from Réveillon to Franklin exists, broaching the possibilities of American markets for paper. The wallpaper manufacturer was a prominent participant in the Montgolfier brothers' first hot-air balloon experiments. It was with Réveillon's assistance that Montgolfier, following the initial trial at Annonay, constructed a massive 37,000 cubic-foot balloon of taffeta coated with fireproof varnish. The Aérostat Réveillon flew first from the grounds of the folie Titon on 11 September, then on 19th September, before huge crowds at Versailles , with its barnyard passengers: a sheep, a duck and a rooster. In October the first manned ascent took place, again from Titonville, using a still larger 60,000 cubic foot balloon. After a preliminary ascent by Montgolfier himself, the balloon, with Pilâtre de Rozier (and according to some accounts the marquis d'Arlandes) on board, soared briefly to 80 feet on its tether over the Réveillon works. Both balloons bore the hallmark of Réveillon's design, with blue backgrounds, emblazoned with fleurs-de-lis, signs of the zodiac and suns bearing the royal visage. "Folie Titon, rue de Montreuil"
Denis Cosnard. "Les trois Cours de l'Industrie, la Folie Titon et l'émeute Réveillon"